home - blog - Kitchen linen, Linen Aprons, Table Linen - Win A Stunning Cookbook in Our Giveaway Competition! Win A Stunning Cookbook in Our Giveaway Competition! 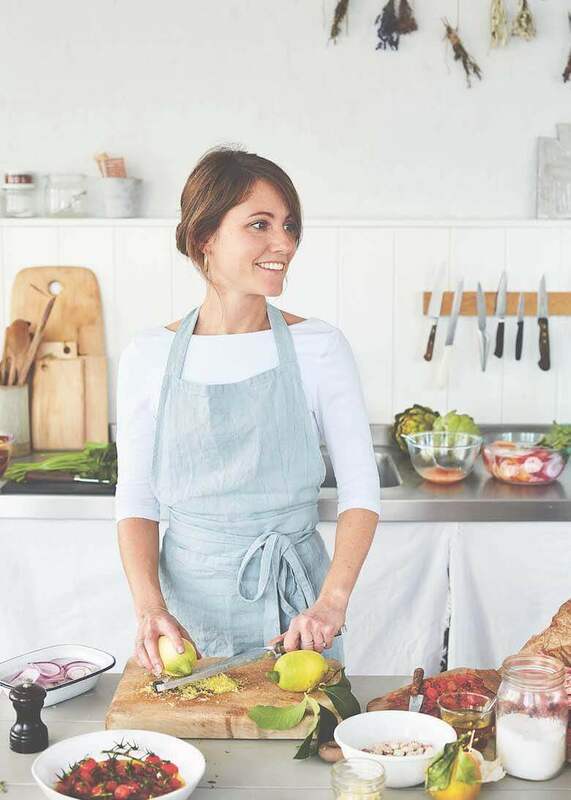 We are thrilled to be offering you the chance to win one of five copies of The New Art of Cooking, the gorgeous debut cookbook from food stylist Frankie Unsworth. To celebrate the publication of Frankie’s book we’ve teamed up with Bloomsbury Publishing for this exciting giveaway competition. 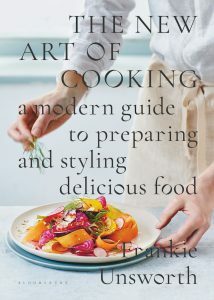 The New Art of Cooking showcases the many styling tips and tricks to make food that looks as good as it tastes with trade secrets from top professional food stylist Frankie Unsworth. It’s true that ‘we eat with our eyes’, and this beautiful, clever book provides a fantastic toolkit straight from the world of professional food styling. It promises to change the way you cook for ever. Recipes cover breakfasts (including the delicious-sounding ‘chocolate granola shards’), snacks, seasonal salads, soups and bowl foods such as ‘herby spelt and yoghurt flatbreads’, ‘asparagus mimosa’ and ‘courgette, pancetta and lemon spaghetti’. From small plates to big dishes and celebration feasts for friends and family with ‘Eton mess ice cream sandwiches’ and the ‘Ultimate chocolate cake’, not only will your cooking taste wonderful, it will look better than ever too. Frankie Unsworth is a food stylist and writer who trained in pâtisserie at Le Cordon Bleu in Paris. She works extensively on photography shoots in London and across the world, and has worked with Rachel Khoo, Nadiya Hussain and Michel Roux amongst others. You can read more about what inspires her, the things she can’t do without and how exactly she happened to be held at gunpoint in this interview. All you have to do is answer the following question, and you’ll be entered into the draw to win. Leave your answer in the comments below or via the LinenMe Facebook page. What is your secret weapon to style a dinner party? Competition closes 23rd July 2018. Good luck! Competition is closed. The winners are: Gillian Ross, Nikki Hilton, Sandra Legros, Jill Reed and Hayley Robson. Competition is closed. The winners are: Gillian Ross, Nikki Hilton, Sandra Le Gros, Jill Reed and Hayley Robson. I keep the glass jars from tomato passata, take the labels off and use them as flower vases on the table. It’s a fun, inespensive way to brighten up the table. My husband buys a roast duck in Chinatown and then debones it and we make duck pancakes with hoisin, chilli, cucumber and green shallots. This never fails to wow people, the cost at a restaurant for duck pancakes is incredibly high versus an all you can eat make, them them the way you want them dinner party option. Whenever we invite people for this it always sparks incredible joy and excitement. It is also a great meal to take to friends houses!! I bought some old glass spice jars in a charity shop and discarded the stoppers. I cut the stem of a flower to a suitable length for each jar or use a few small flowers and a bit of foliage and add water to the miniature jar and to make a pretty decoration for each place setting. I can split up a shop bought bunch or use some bits and pieces from the garden such as grape hyacinths and primroses in the spring and holly and hellebores at Christmas and suit the decoration to the season in a cost effective way. I’m slowly filling my cupboards with unique handmade ceramics, but my other secret weapons are neutrally toned table linen, simple pillar candles on glass or brass holders, some delicate stem-less glasses for wine, a simple (but beautifully designed) carafe for water, and some kind of wild/simple greenery such as eucalyptus to adorn the table. No guests…..dinner parties are far too stressful (and far too grown-up too! I have collected plates, platters and serving bowls in various places when on holiday. I try to use appropriate crockery to style my table, so Moroccan plates & tagines when serving Middle Eastern food, Spanish & Italian crockery when serving Mediterranean food, and Indian copper & brass coloured metal dishes when serving curries. 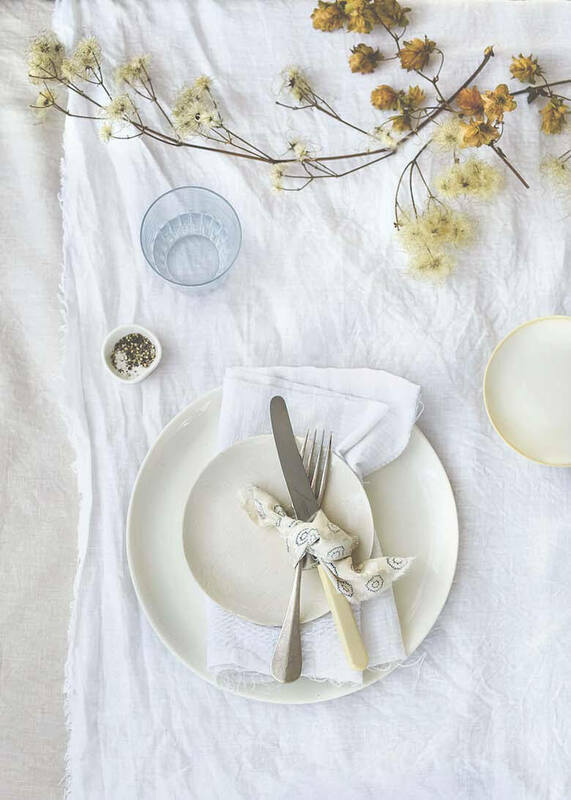 Decorate the table with a nice cloth and accessorize simply – really styles it up without much effort! Plan Ahead. Check and Recheck. Plan a Low-Maintenance Meal. Do a Test Run. Kepp it simple but elegant and evering should be very clean! I keep everything clean , bright and white with fresh garden flowers to give some colour to the table.